For nearly 90 years, Island Center Hall has been a focal point of community activities ranging from dances and community social events, to elections and church services. The one thing it hasn’t been is a school. Island historian Katy Warner says, “Everyone thinks it was a school; it never was a school.” The old Island Center School was actually located on the adjacent property, relocated first to the High School, then to Strawberry Hill Park, and finally to Ericksen Avenue where it is now the Historical Society Museum. Property for Island Center Hall was donated by W.L. Gazzam and his wife Lulu in August of 1913 to the Island Center Improvement Club. In their donation, the Gazzam’s specified that the property had to be used as “a meeting place for the community of island center”, and “no spirituous liquors will be allowed”, nor could the property be used for “unlawful meetings or purposes”. The improvement club soon organized volunteers and got donations of materials and money to build the building. Besides being used for a great variety of community events, Island Center Hall was the location of the Bainbridge Island Fair for a number of years. In December of 1971, the Hall was given to the Bainbridge Island Park District. At the time, Annie Hansen and Ralph Anderson, the last living members of the original Island Center Improvement Club agreed that the Hall should be preserved for the community by the Park District. Approval of the transfer was also given by Gazzam’s three surviving daughters. Today Island Center Hall continues to serve its intended purpose. Concerts, lectures, weddings, community meetings as well as recreation classes such as swing dancing, fencing, yoga and jazzercise, are regular events. Its size and warm wood interior make Island Center Hall a special place and a community treasure. Bainbridge Island Parks and Rec District website. 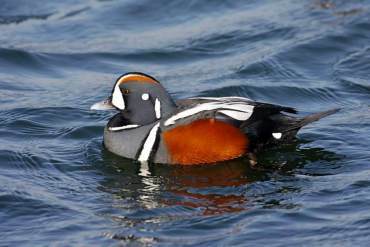 A Harlequin Duck. Photo courtesy of the West Sound Home & Garden blog. Calling all amateur ornithologists and birdwatchers! Did you know that the Bainbridge-to-Seattle route on the Washington State Ferries system offers some prime viewing opportunities for birders, and that autumn is one of the best times to do it? According to a recent post by Joan Carson on the West Sound Home & Garden blog, those with a keen eye are likely to spot cormorants, Barrow’s goldeneye, Bufflehead and Scoters feeding near the Eagle Harbor dock and near the ferry’s churning propellers. Regulars to the Winslow ferry terminal are familiar with the long ramp that leads from the pick-up area to the vessels. Carson advises bird-lovers to take advantage of the ramp’s large windows and high vantage point when looking for birds. Oh, and maybe bring the binoculars! The article includes a roster of birds to look for at other ferry terminals. To read it for yourself, you can check it out the West Sound Home & Garden blog here. Join your neighbors and read Divakaruni’s book, One Amazing Thing. Nine disparate characters are trapped together after an earthquake, each of them takes a turn telling “one amazing thing” about his or her life. Admission: Free and open to everyone! Strawberry Hill Center on Bainbridge Island offers a variety of art classes and summer camps. Strawberry Hill Center, once the site of Strawberry Hill Alternative School, hosts a variety of art classes, cooking classes, chess tournaments, poetry, language classes, summer day camps and more. The BIMPRD Board meetings are held twice a month in the large room. This facility has internet access and windows in all rooms. There are 2 bathrooms, one with a baby changing station, and storage for BIMPRD classes. The large meeting room (approx. 26’ x 27’ linoleum floor), seats 50 people max and has a white board, tables and chairs. There are 7 double electrical outlets. Kitchen area (work area 10’ x 12’ linoleum floor, additional teaching area 13’ x 12’) includes 2 stove top ovens, a microwave oven, a full size refrigerator, 4 sinks, dishwasher and center countertop work space. Cooking utensils and equipment are not available. There are 2 double electrical outlets by the sink area. Adjacent to the kitchen is an art room (26’ x 18’ linoleum floor, seats 20 max) with 2 separate sinks, tables and chairs. There are 6 double outlets. The small meeting room (11’ x 13’ carpeted floor) seats 8-10 people max. There is a phone, a white board, tables and chairs. Some audio visual aids are available as well. There are 4 double outlets. When Park Classes are not in session these rooms are available for rent. This article was adapted from the Bainbridge Island Parks & Rec District website.